Image caption Adelaide Oval claims instructions from the police were "misinterpreted"
A member of staff at Adelaide Oval's box office says she was told not to sell Aboriginal people tickets to a sporting event. The sports fans were attempting to see an Aussie Rules football match that celebrated Aboriginal and Torres Straight Islander cultures last July. The staff member claims she had to tell people the game was sold out. 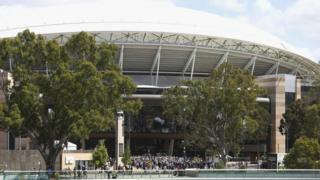 Adelaide Oval apologised and said that directions from police were misinterpreted by staff. The woman, employed by McArthur Recruitment, told ABC News that the box office supervisor "turned around and told everyone in the box office we'd been told not to sell tickets to any more Aboriginal people". A spokesperson for McArthur Recruitment said: "The ticket office staff followed the instructions of police and security and did not sell tickets to anyone for around an hour while the police and security managed the situation. "Security returned to the box office after the incident to reiterate their instruction not to sell tickets to a number of people that they pointed out to box office staff." The woman said that she lied to some customers, telling them there were not any tickets left. She resigned from her post the following day. A spokeswoman for South Australia Police told the BBC that they responded for a "request for assistance where some patrons attempting to enter Adelaide Oval, or purchase tickets to enter the ground, were clearly intoxicated. "Police at no time made any direction to the ticket sales employees about the sale of tickets." Darren Chandler, General Manager of Operations at Adelaide Oval said: "It is extremely disappointing that a supervisor in the ticketing office misinterpreted a message from police and didn't follow established protocols that would have clarified the situation. "We are unequivocal in our stance that everyone is welcome at Adelaide Oval and we condemn discrimination in any form. We apologise to anyone affected and have taken steps to ensure this situation doesn't arise again." News of the incident comes less than a month after Accor Hotels confirmed it was investigating claims that staff at one of its Australian hotels had been racially segregating guests.